Caravan Clubs: MMM - find the right caravan club for you. 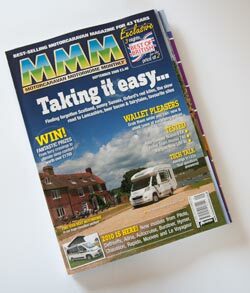 Motorcaravan Motorhome Monthly is more commonly known as MMM. It is THE motorhome magazine that all of the others wish they were. MMM has an old fashioned feel and is absolutely crammed with up to the minute information. It is one of those monthly magazines that looks like it would take 2 months to really do justice to when reading it. MMM does not have its own web site, rather it shares a site with other motorhome and caravan titles from Warners called Out and About Live. There’s a discounted subscription offer here.